You are welcome to the world of Narayan Medical College & Hospital. Narayan Medical College and Hospital(NMCH) got the approval to start MBBS course from 2008-09 academic year. After recommendation by the Medical Council of India (MCI), the Ministry of Health and Family Welfare approved MBBS program for 100 seatswhich has been now increased to 150 Seats from the year 2018 after recommendation by the Medical Council of India (MCI) to the Central Government. NMCH will always strive to scale new parameters in the field of health education and research. The beginning has been made over 25 acre of land that houses the Medical College building and a 650 beded hospital which offers the best medical care and attention to each and every category of patients and provides the world class health care services by experienced doctors and health professionals. Lt. Deo Narayan Singh and Lt. Mangla Devi Parents of Sri Gopal Narayan Singh had a dream for a hospital in their village to take care of badly needed health needs of deprived people of Rohtas District of Bihar. Keeping their dream in mind Shri Gopal Narayan Singh formed a trust by the name of Deo Mangal Memorial Trust. Under his guidance the Trust open a charitable hospital by the name of Narayan Chkitsalaya with the sole aim of catering to health care need of poorest section of the society. The hospital has catchment area of Rohtas, Kaimur, Aurangabad and Bhojpur in Bihar and Garwah and Palamu in Jharkhand. Slowly and steadily the hospital became very popular in masses and it was decided to convert the hospital in a medical college by the name of Narayan Medical College & Hospital, to give better services and do research work. It also provided opportunity for higher education which was badly lacking in this part of the world. It also gave immense direct and indirect employment to the local masses. Narayan Medical College & Hospital has always being considerate about the healing and the very theme “Hamara Sapna Swasth Bharat Ho Apna” with the philosophy of making disease free INDIA by not only treating patient in our hospital but also graduating and post graduate doctors every year who will spread all across India to make India healthy. Narayan Medical College & Hospital, Jamuhar (Rohtas) is located on old GT Road between Sasaram and Dehri-on-sone at an equidistance of 8 Kms. It has a sprawling campus of 25 acres with full-fledged Medical College and Hospital. Narayan Medical College & Hospital has more than 650 beds hospital. OPD having computerized registration system gets large patient inflow per day. OPD is available in General Medicine, General Surgery, Obstetrics & Gynecology, Orthopedics, ENT, Ophthalmology(Eye), Pediatrics, Psychiatry, TB & Chest, Dermatology, Dentistry, Neuro-Surgery, Cardiology, Urology, Nephrology, Gastroenterology etc. The hospital is equipped with all modern facilities. Hospital has 24 hours Emergency services including OT, Blood Bank, Pharmacy, Ambulance, Radiology and other diagnostic facilities. To take care of critically ill patients the hospital has fully equipped and functional ICU, ICCU, NICU, PICU, SICU, RICU and separate Burn ICU. 24 Hrs Emergency services are available in the hospital which is of great help to the local masses. The investigation wing has all diagnostic facilities in Pathology, Biochemistry, Microbiology etc. The Radiology department has X-Rays, Digital X-Rays, Mobile X-Rays, USGs, MRI, CT Scan, Mammography etc. Hospital has dedicated OT complex with 10 well equipped operation theaters having equipment for laparoscopy surgery, Endoscopy, Arthroscopy, Lithotripsy etc. All department viz Surgery, Eye, ENT, Gyane, Ortho etc. has their separate well equipped operation theaters. Hospital is also equipped with a modern Cath Lab to take care of Invasive Cardiology procedures like Angiography, Angioplasty, PPI etc. 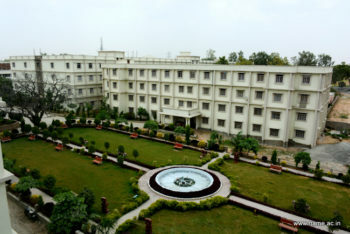 The Institute has its huge residential campus with accommodation for faculty members and residents. There are separate hostel for boys are girls. The residential complex also includes accommodation for the non-teaching staffs. The college has adequate facilities for recreation and playing ground with the sports material for the students. Both indoor as well as outdoor sport facilities are available. The institute has an objective to provide affordable medical facilities to the needy and poor masses of in and around Rohtas including nearby districts of Bihar and Jharkhand. The Prime commitment of the Institute is to develop educational principles and practices which are the best suited to the needs of our country and to meet the problems of community health. The curriculum is constantly reviewed at College Council levels and the required changes in the curriculum are brought about in order to evolve a pattern which is the most suitable for the Indian needs and conditions fully abiding by MCI norms. The medical students get sufficient impetus for high quality of education from highly competent faculty at each level.